Citizens´ Association "Landsberg im 20. Jahrhundert"
Citizens´Association "Landsberg in the 20th Century"
The Citizens´ Association "Bürgervereinigung Landsberg im 20. Jahrhundert was founded on 9th November 1983 and has been leading the preservation of the remains of a former concentration camp. After purchasing parts of the still remaining former concentration camp Kaufering VII, the expansion into the European Holocaust Memorial began in the next decade. The European Holocaust Memorial holds the last remainses for the largest concentration camp commands on the former Nazi-German empire ground e.g. five ruins of concentration camp bunkers and the last traces of concentration camp earth huts. The „Bürgervereinigung Landsberg im 20. Jahrhundert“ moved it back to dignified conditions. The other, unkempt and neglected part of the concentration camp which is under possession of the city of Landsberg, was levelled and backfilled. The "Bürgervereinigung Landsberg " was able to expand a part of the former concentration camp into a monument of (inter) national importance and put it in a worthy state and place of commemoration. Since 1983, the Bürgervereinigung has secured the last trace of the concentration camp complex Landsberg/Kaufering including 11 commandos in the town and district of Landsberg and collected materials, documents, sources and reports. Parts of these research results were published by us in the "Themenheften Landsberger Zeitgeschichte". In addition to sharing knowledge about the story to the younger generation, our theme books have also been and still have the task of reaching more times and encouraging them to record their life stories ("oral history"). Jews from all of Europe were deported in the eleven concentration camp commandos of Kaufering. Within only ten months at least 6.500 were murdered. 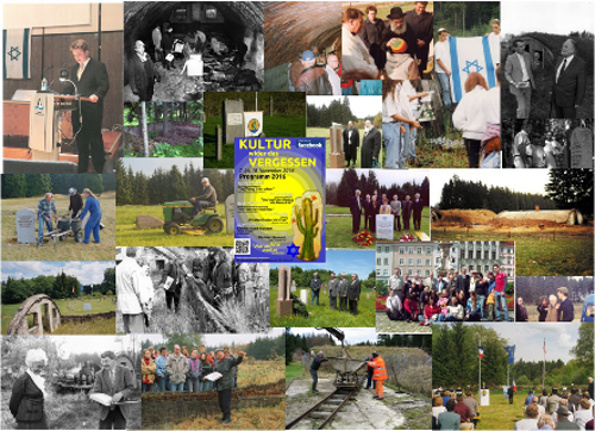 In honor of our deceased president and founding member Anton Posset, the respected historian and internationally well known pioneer of the remembrance work here an overview of his work and his employment without which today's European Holocaust memorial would not be a monument of international importance. An overview can be read in english on Wikiepedia or on our German site.